Looking west along W. Clark Street. R-L. Jones Ice Cream Parlor, Gin Mill (2013), W. E. Morgan Hardware, last building later the American Legion Hall. 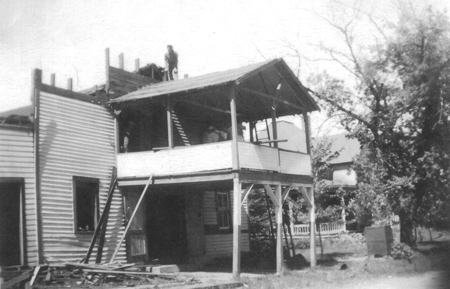 This building was on the property where the Unity Memorial Hall stands today (2013). 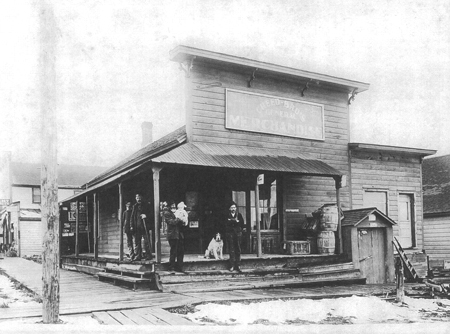 In the early 1900s, Creed Bros. Mercantile sold general merchandise. Denny Kuehling's mother, Myrtle, remembered an ice cream parlor there too. Looking towards West Clark and Madison Streets. 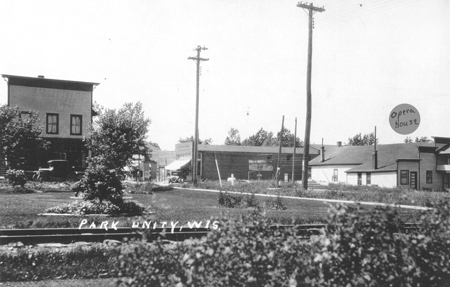 Unity Opera House in right foreground. Brick store now has only one story and next is a garage with a gas pump on the street. 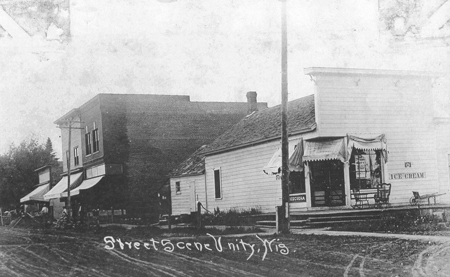 Van Miesener's Barbershop on left. Early 1920s. Looking north on South Madison Street from the corner of West Cook Street. Front Street (Highway 13) business stores. West Clark Street looking east towards what is now Highway 13. Very early 1920s. 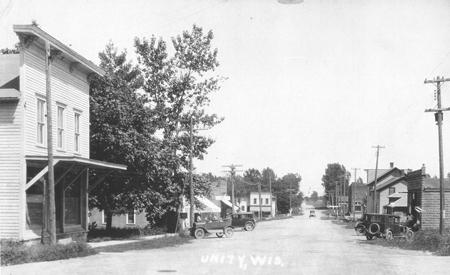 Unity Opera House 1901. The balcony was used by the band for summer concerts. 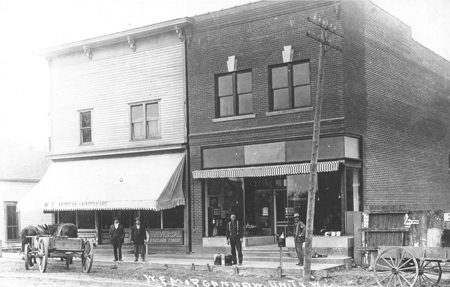 The smaller building was the barber shop of Van Miesener. Demolishing the Opera House in 1948 to make way for the Memorial Hall. The Unity Band would play for the residents from the open balcony on summer evenings.